The Hondon Valley (» Map) is a beautiful, tranquil and mountainous area of Costa Blanca South, Spain. The area is very fertile, in fact an argricultural miracle of acres of vineyards, almonds & olive groves. Hondón is very dry and typically gets over 310 days of glorious Spanish sunshine per year! Summer temperatures are typically mid 30° celsius with a cool afternoon breeze. Winter temperatures average about 18° celsius but can be very cool on dull days in January & February (you might need a jacket). The locals describe the area as "tranquilo". So the Hondon Valley is a great place for that "get-away-from-it-all" holiday or to live peacefully in that typical Spanish mañana lifestyle. Many happily embrace the good clean air, the splendid vistas, the excellent fresh produce and the very cheap local wine... come join us. SALUD ! | Facebook Hondon What's On? The HONDON.CO.UK website is about the glorious and relatively unspoilt Hondon Valley and surrounding areas. You can read about local tourist events, culture and news. We also show some local property for rent in Hondon De Las Nieves & Hondon De Los Frailes... kindly sponsored by the local and trusted Estate Agents "Hondon Villas" (Frailes / 30+ years experience and AIPP registered). We hope you find something of interest!... And please email us your ideas, stories, pictures and Hondon related experiences. We'd love to hear from you. 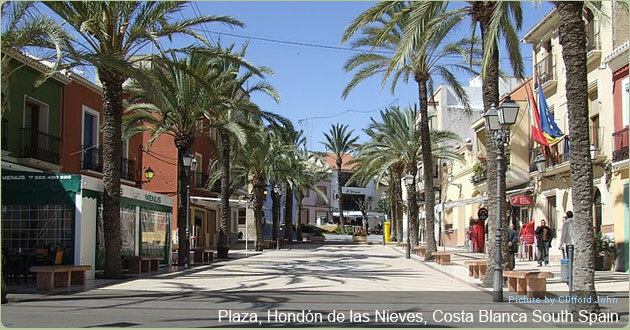 Hondon de las Nieves is a small village, inland, west of the Alicante Region. It's nearest city is Elche (City of Palms) to the south east or Crevillente (20 min's drive). Nieves and it's very close neighbouring village 'Hondon De Los Frailes' are typical rural Spanish villages: small, quiet, quaint, friendly and have changed very little over the years. The local economy relies heavily on agriculture /farming (it's a very fertile valley), construction / quarrying and foreign property investment. Table grapes, almonds and salad vegetables are mainly grown in the Hondon area but you will also see many other root crops and fruits grown here, such is this fertile and sunny valley. There area can employ 10,000 casual worker during planting or harvest times. With in easy driving distance are many vineyards that grow, produce and sell local wines (extremely cheaply). Nieves has a world class "Bodegas Cerdá", a local and proud wine merchant. The shop/museum is well worth a look whilst sampling their excellent wines and tapas. Although in recent austere years there has been a decline, the other dominant industry is construction. There are many limestone quarries here servicing the Costa Blanca building trade for cement products. Hondón de las Nieves (en Valencia, El Fondó de les Neus) es una población de la Comunidad Valenciana (España) situada en el suroeste de la provincia. Spanish Property Agent Get listed with a professional and experienced agent in the Hondon Valley. Sell your property for less: Always use a local real estate agent with local knowledge and lower fees to sell your villa or apartment in the Hondon Valley. Web design services for business start-ups and property agents. Original material not to be copied or used without express permission from the copyright owner. Disclaimer:We have supplied the information on this website in good faith but it is only meant as a guide, nor are we liable for any inaccuracies or changes since publication on this site. Prospective purchasers of services, goods or properties mentioned on this website should satisfy themselves as to any information given. We strongly recommend using qualified persons, legal agents or solicitors familiar with the area or service you are interested in pursuing.